My grandmother was sweet, incredibly kind and joyous. At a young age, she was surrounded by grandparents who doted upon her. This attention and leadership from elders certainly helped mold the person she was to become. Marguerite Robinson Campbell Reich, Peggy, Mom, Gramarite. She lived near “The City,” fondly looking over her beloved Palisades and even the Empire State Building. A true adventuress, she was fascinated with knowledge, reading and travel. Life was a grand adventure to her, always adding in a little sparkle or whimsy to enliven a scenario. As magic makers might, she wove her view well beyond her physical life. Artwork and phrases that spoke to Marguerite became household adornments or features of love notes. Writing autobiographical tales in narrative occurred more than once. Newspaper articles, Hershey’s Kiss ribbons and pressed flowers became thoughtful gifts. They surface in my notebooks, jewelry boxes and dresser drawers, filling my life with her unrelenting appreciation for life and commitment to grace. Compassion, Affection, Respect and Empathy are key ingredients for relationships. C.A.R.E. Recipe. -Author Unknown. 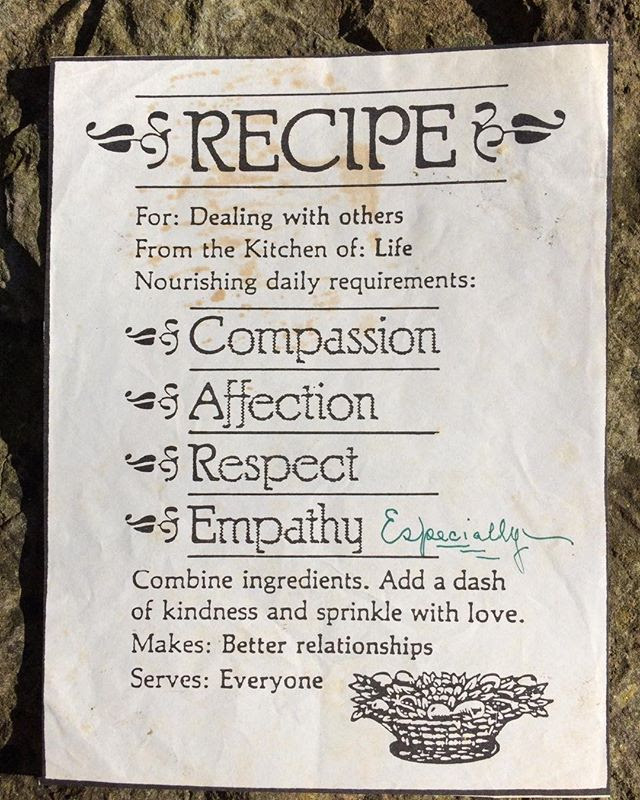 As we approach the holidays and endure our various challenges, this recipe can help everyone! Compassion, Affection, Respect and Empathy. When outraged or confused by someone’s behavior, please consider their perspective, goals and challenges. Respect others as we travel about for our holiday shopping or festivities. Consider others may not enjoy the season and understand strong emotions the holidays may bring. One Christmas Eve when I was little, my dad took me with him to deliver food baskets. Puffy, white snow was falling and covered the ground. We took a basket of food to an elderly couple in a small home. I seem to recall it being very cold but my dad’s visit filled the room with warmth. The couple’s gratitude is unforgettable. Another year, our living room was covered in donated stuffed animals that we loaded in our van to deliver to a collection and distribution point. It may have been a school. I remember a huge stage with piles of toys for children. The spirit of Christmas was present as we imagined the children opening their gifts. Truly taking the time to be with family is an amazing gift! In the face of difficulty, being with loved ones proves most important. Does your use of devices separate you from those around you? Are your family your loved ones or merely obligations? Erin Marteal wrote a fantastic article entitled, “Gratitude Pairings, Naturally.” First published in Tompkins Weekly, Erin, Executive Director of Ithaca Children’s Garden gives numerous suggestions for creative pairings of activities and foods to share with gratitude. I’m looking forward to visiting the Fuertes observatory-per her recommendation. As well as constellations of homemade cookies and thermoses of host chocolate! Consider some of her ideas and work out a few of your own. You might discover what fun it is to gather items for a wreath or wail your sibling with a snowball. Have you ever made snow angels?! New Park Retreat and Event Center is opening their doors this coming Thursday, December 14 5:30-9:30. Guests will be treated to live music and refreshments, with donations benefitting local food security organizations including The Backpack Program, Fresh Snack Program and Friendship Donation Network. 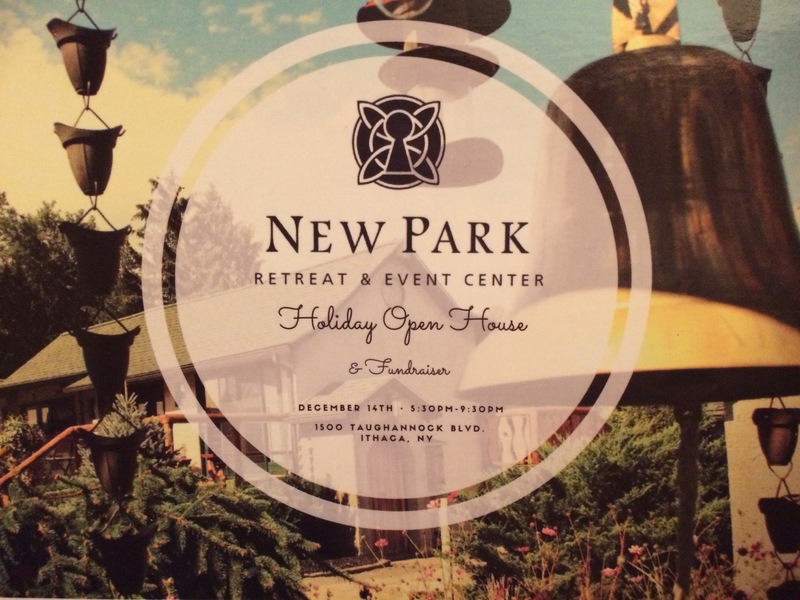 New Park Retreat & Event Center celebrates the holidays with an open house December 14, 5:30-9:30 at 1500 Taughannock Blvd. Ithaca, NY. Hope to see you there! I’m heading back outside to look at the stars! Happy Holidays!